The other day during a conversation with someone close, I noticed something about our interaction. It was a simple conversation, nothing too deep or seemingly important, but a pattern revealed itself. The pattern was simple: I jump to offense. Let me explain. This means that my mind appears to be on a quest to find a way to be offended at what someone else is saying. By quest, I mean that my mind considers this its highest priority and will devote both time, energy, and resources to ensure the quest’s success. My Jump: So are you saying that I should have sent these out? My Jump: So they expect me to plan this then be responsible for meeting everyone’s idea of what is fun? My Jump: So they are saying that I am overspending? There are risks in jumping to offense, just like the risk of jumping off a cliff. It is dangerous and there is unseen peril just beyond the lip. Luckily I am beginning to notice this pattern as it occurs (or shortly afterwards). 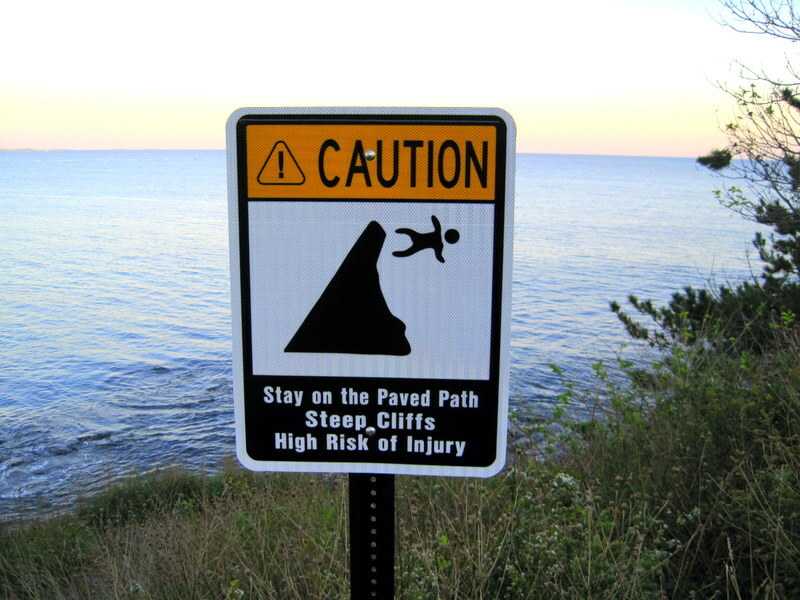 I realize that I need to retrain my mind to see the warning sign on the edge of that cliff before I go off jumping. Picturing that warning sign helps, but also explaining to the person I am talking with if it begins to happen. Recognize your bent toward Jumping to Offense. Understand that Jumping to Offense is dangerous, for you and others. Slow down and listen, don’t respond right away. Ask clarifying questions, make sure you understand what the other person is saying. If you do jump, climb back up and reconcile with those around you. P.S. I am going to print out this photo and put it where I can see it every day. This is awesome. I wish I could put a little hologram of this photo at the inside edge of my glasses so I could see it all the time. I am going to use this post OFTEN in my life. Thanks friend. So glad you liked it! Got to use it a few times today already. I will work on the glasses idea.